This isn’t a typical post for me in that I have a few thoughts today instead of one theme. Today I wrote in a large whelping box, with a pig pile of three-week-old Irish Wolfhound puppies scattered on and around me. The quiet was warm and soft, not like the quiet when writing at the table at home. The air smelled of goat’s-milk belches, and that clean distinctive scent of new puppy. For two hours it was a peaceful place, and words flowed. 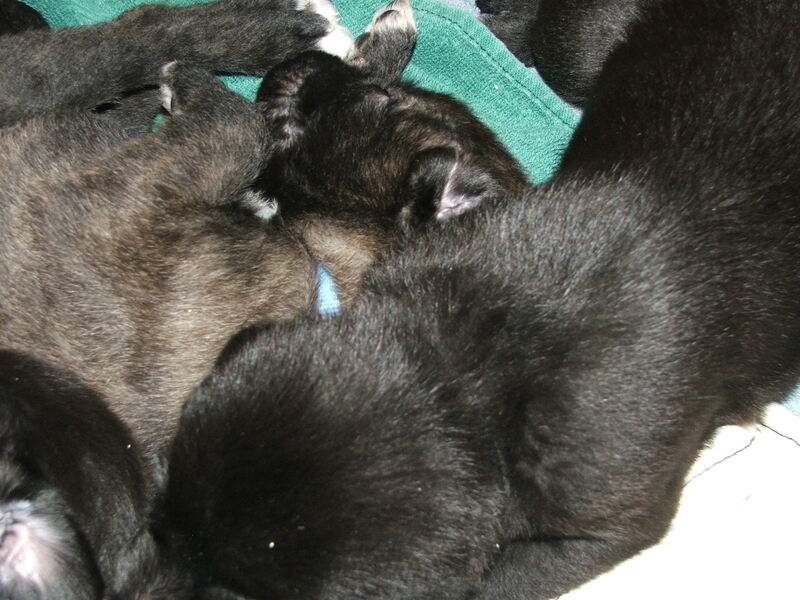 Of course that was followed by a frenetic, charged, insane fifteen minutes of bottle feeding those same puppies, as they scrambled to gobble as if afraid I was going to take the bottle away too soon. But once the tummies were distended, they made their grunting way back to sleep, and gave me back the quiet inspiration to write. Who would have thought any writing could be productive in such a place? Lisa, from the satsumaart blog listed on the sidebar here, sent me a writing prompt today. I agreed to be on a list and when I opened the email I saw, in huge letters, ‘Write Lisa! It’s what you’re here for’. Okay then. Something that strong begs to be answered. The prompt was ‘salvation’ and I was only supposed to write for 10-15 minutes. I remembered that twenty minutes later. I’ve never been a huge fan of prompts, as mentioned in previous posts, but who could ignore that opening. Write Lisa! It’s what you’re here for. I need that branded in a place I’ll see every day. On the back of my hands, maybe, visible as I stretch for a pen, or a keyboard. When I wrote that, there was this epiphany moment, ‘Mountain rain’! There’s the title. It would mean more than just the expected. The problem is, I can’t come up with a title for the first story. Initially I called it Left in the Dark because of the theme of the story. A girl left in the dark about her life, a grandfather left in the dark about his parentage, a town in the dark about murders, a woman left in the dark at the bottom of a mine shaft. The title would mean so many things. I didn’t get favorable comments on it though, and someone suggested Blood Bonds because of the bonds of family. Those who didn’t like the first suggestion liked the second. But since then, Twilight has come along, and every time I see that title, I think vampires are going to fly out of the laptop screen. Yet I can’t come up with anything else. To be honest, I still like the first one. Titles. Blah. Back to writing and listening to new music suggested by friends. Oh, I am so glad the prompt worked for you! And yes — I did want that top “write, it’s what you’re here for” admonition to be huge. That will stay at the top of every prompt email. I need the reminder too. I have a really hard time with titles too. Every now and then I will come up with one that feels perfect, but when that doesn’t happen, I just feel like I’m floundering and floundering and exposing the most cliché grooves of my thought. I’m not good at titles for stories either. Lately I label stories and regular blog posts with the first inoffensive words that come to mind. This seems to have worked a little better for me than trying so hard. Of course I haven’t read your book, but I find your titles intriguing. I’m not sure I know how I feel about Blood Bonds, except that I’m not immediately drawn to it because it sounds like a lifetime channel movie. Which only means that they’ve associated a lot of serious-sounding titles with plodding third rate movies. I haven’t seen the prompt yet because I just got home and I’m dehydrated, hungry, and tired. but I’ll see if I can write anything before I go to bed. How wonderful!!! I love the email!!! “Write Lisa, thats what you are here for”!!! Maybe we need to engrave it in your pen?? YOu should put it as your screen saver! I forgot to ask you about the puppies and how babysitting was, but I guess we didnt have enough time before I went to dinner. Oh and my opinion on your title. Leave it the way you had it in the first place. I always liked it and the connection with the story.